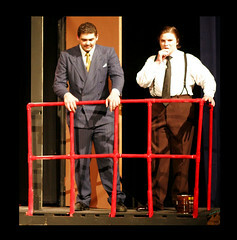 PhotoDay......Jim Scolman: "The Glass Menagerie"
Tennessee Williams walked the stage during the Monroe High School production of the William's classic, "The Glass Menagerie" opening night, Thursday, 3/16/2006 at Monroe High School. Tom Wingfield, center, the Son, played by MHS Senior Scott Britton, gave narrative voice to Tennessee Williams words and insights to the characters, lives and motivations of the four member cast. Tom paced the stage, lit by a spotlight, offering biting, philosophical commentary on the lives and times of his Southern family on the eve of the Great Depression. 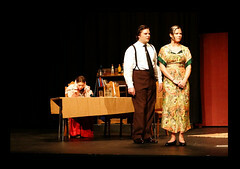 "Brittany Beck, right, a Junior, gave a spirited performance as Amanda Wingfield, the Mother. A faded Southern Bell transplanted to a back-street walkup in St. louis. Beck brought to life the past glories of a young woman of a certain Southern Class with now failed expectations. She held desperately to the dreamy memories of how life was and still should be. The Daughter, Laura Wingfield, played by Sophomore Brenna Landon, filled the Glass Menagerie Keeper with dignity, strength and a firm grasp of reality sadly missing in her Mother. Nathan Crume, Senior, left below, gave the mythical "Gentleman Caller" character hope and possibility when he appeared in the second act. Crumes scenes with Laura offered the sweetness and poignancy of a shared, remembered past and a possible future that was not to be. In the production notes for the play Tennessee Williams said,"Being a 'memory play', The Glass Menagerie can be presented with unusual freedom of convention." Monroe High Drama Director, Karl Akesson took advantage of this freedom by using lighting effects during scene changes, sound cues, and displaying visual images on a scrim above the stage. These images highlighted action and dialogue on stage.